Designing an efficient and comfortable 7-foot-by-12-foot kitchen is an exercise in the maximization of tight spaces. 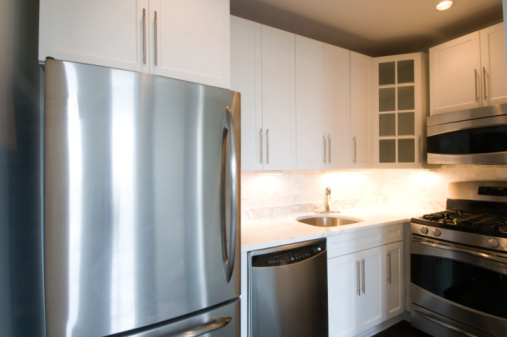 A kitchen design includes appliances, sink, wall (upper) cabinets and base (lower) cabinets. Draw the kitchen design on graph paper, using pencil, dimensioned in inches. You can draw both a floor plan, which is easier to use as a space plan, and a front-view elevation. 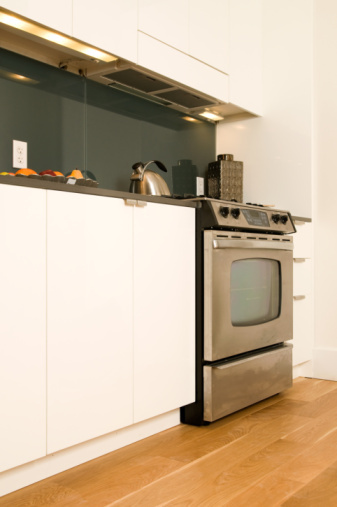 Indicate measurements of each appliance, cabinet or other component on the plan. Select essential appliances and calculate dimensions: allow 30 inches or 36 inches for the refrigerator, 24 inches for the dishwasher, 30 inches for the stove and a space-saver microwave that fits under a 30-inch-by-15-inch two-door cabinet located over the stove. Place the sink base, which is 36 inches, next to the dishwasher. The sink base is often placed under a window. Plan placement of the stove, which is never next to the refrigerator. Allow 9 inches next to the stove for a 30-inch-by-9-inch wall cabinet for spices and a 9-inch base cabinet for cookie sheet storage. Add a 24-inch diagonal corner wall cabinet with round roller shelves. This cabinet allows for a 36-inch lazy Susan base cabinet. Fill the remaining spaces on the plan with wall and base cabinets. Cabinets are calculated in 3-inch increments starting with a width of 9 inches. Stack cabinets in equal widths, for example, a 21-inch base cabinet under a 21-inch wall cabinet. Fill odd dimensions on the plan with filler strip. Filler strip is from 1/2-inch to 3 inches wide, cut to the height of either the base or wall casework. Anne Rose is a communicator with a Bachelor of Arts degree in English editorial from Northwestern University, with expertise in interactive media, event marketing and public speaking. She is a freelance writer and blogs, tweets and webs for various clients. What Is the Standard Width of a Kitchen Countertop?